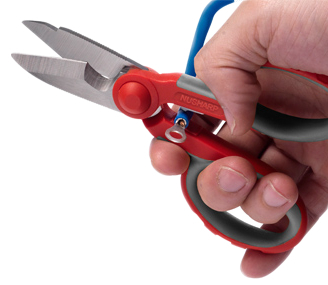 These Electrical Shears are an electrician's choice scissors. They are designed for use in electrical, telephone and datacom installation and service applications. The blades are made from high carbon alloy steel from Japan and are infused with Molybdenum and Vanadium through a proprietary manufacturing process to achieve a level of hardness (HRC 58~60) to cut soft cables. A notch close to the hinge provides placement of cable for highest cutting force due to leverage. One blade is micro-serrated for non-slip cutting. The blades are also outfitted with sporty ergonomic handles made of Nylon with 30% fiberglass and TPR over-molded for comfort. 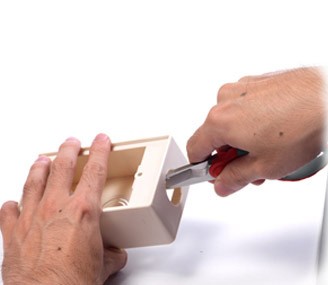 Very sharp cutting edges to easily cut soft cable up to 50mm2 / 8mm dia. These are awesome shears. I've truly torture tested them. I use these everyday, they are part of my bag. Well worth the money. Working for UofOklahoma I do a lot of building maintenance. I have had these shears for 6months & they still feel like they are new. I have used them to cut 4 conductor 14 guage soft wire & they do a great job. I tried them to cut low voltage wire. Rated upto 14/3 low voltage soft wire but I cut S00W 12/4 wire and it cut it easily. Stays sharp for a long time if not abused. A friend is in data communication; he uses ATi-811 and promises by it. I bought and tried it; strongly recommended it.